The United States is currently a leader in EV technology and innovation, thanks in part to the federal tax credit that has helped bridge the gap in cost between plug-in vehicles and their conventional gas-powered counterparts. Our research shows that these incentives play a key role in building the EV market—by creating policy certainty for automakers as well as encouraging the purchase of EVs. The Energy Policy Act of 2005 and the Energy Independence and Security Act of 2007 created a federal tax credit for EVs to serve as a purchase incentive. The credit applies to all plug-in vehicles (PEVs), including plug-in hybrid vehicles (PHEVs) and “pure” battery electric vehicles (BEVs) with a minimum battery size of 4kWh (which is met by all personal vehicles available to consumers. The amount of the credit depends on the vehicle size and battery capacity. Long-range PHEVs and all available BEVs receive the maximum credit of $7,500, while shorter range PHEVs receive $2,500 or an intermediate amount. More than twenty states also provide some form of purchase incentive, generally at significantly less value than the federal credit. The credits are designed to support the EV market until it becomes self-sustaining. This is a strategy that has worked in the past: telecommunications, aerospace, computers, and pharmaceuticals are examples of new market sectors that launched and flourished thanks to early government support. As companies bring EVs to market, manufacturing costs will drop. Indeed, manufacturing costs of batteries and EVs have fallen dramatically already. Because EV fuel and maintenance costs are very low, providing government assistance to help offset initially high upfront costs is key to ensuring consumer access to EVs. The federal EV tax credit is strategically designed to avoid wasting taxpayer money on mature businesses that do not need extra support. 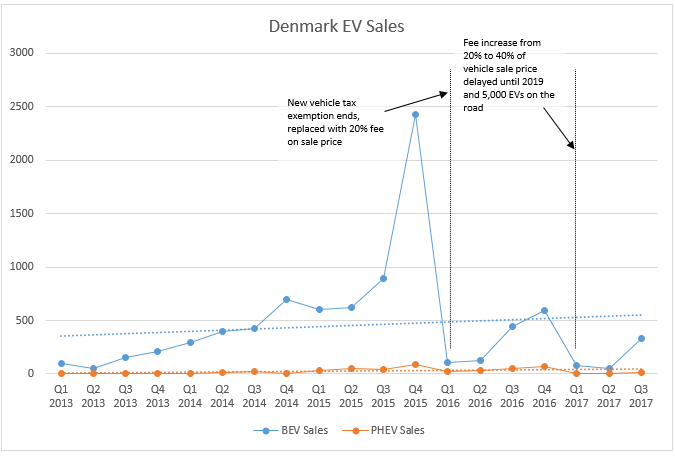 The total number of rebates provided to a given EV manufacturer phases out after that manufacturer reaches 200,000 qualifying sales. The credit remains available for other manufacturers to encourage latecomers to enter the market. The first wave of EV manufacturers—such as General Motors and Tesla —will hit the 200,000 sales mark in 2018 leading to a phase-out of federal assistance for their vehicles. However, many other automakers are just entering the EV market in a serious way now. If the tax credit vanishes, this momentum may too. Research shows that the federal EV tax credit is having a real and positive impact on the EV market. Surveys conducted by the Institute of Transportation Studies at University of California, Davis (ITS-Davis) show that nearly 30% of consumers who bought EVs in early markets cited the EV credit as a factor that influenced their purchasing decisions. The availability of the credit had much less influence on (presumably less price-sensitive) buyers of the more expensive Tesla Model S. Almost half of Nissan Leaf buyers and 40% of Chevrolet Volt buyers said that they would not have purchased their cars without the credit incentive. This finding was validated by a systematic literature review released by ITS-Davis in 2017. 32 out of the 35 studies examined in the review identified clear relationships between financial purchase incentives and the sales of PEVs in the U.S. and around the world. The review also found that removing incentives too early could negatively impact EV markets. In 2015, for instance, the Netherlands decided to focus their incentive on only all-electric vehicles, removing support for plug-in hybrids. Plug-in hybrid sales dropped precipitously the following year. 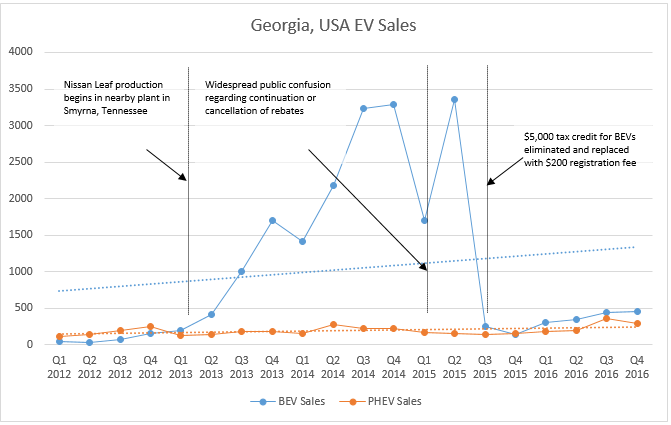 Closer to home, we can look at what happened to electric vehicle sales in the state of Georgia. When the state purchase rebate was removed at the end of 2015, the federal tax credit remained as the only EV purchasing incentive. This was not enough to sustain the budding EV market, and sales plummeted as a result. 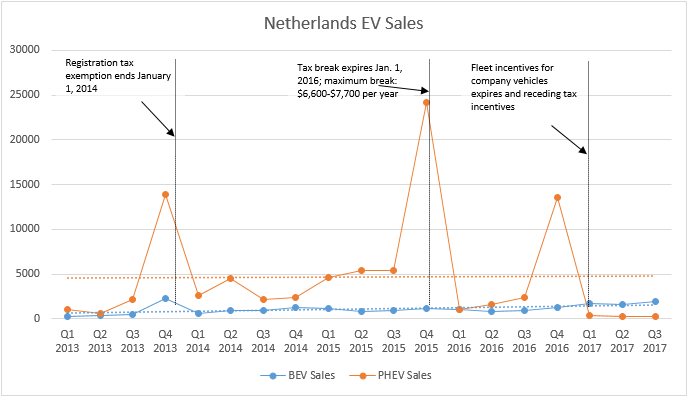 The Netherlands effectively forced a switch to all-electric vehicles for buyers who were influenced by the incentive. In Georgia, unfortunately, EV sales dropped and shifted back to conventional vehicles. Automakers rely on predictability in the regulations that govern their sales, whether those are fuel-economy standards, zero-emission vehicle targets, or purchase incentives to help launch new promising technologies. Automaker plans for upcoming plug-in vehicle models were based on an expectation that the federal tax credit would remain in place for the first 200,000 PEV sales from each manufacturer. With this in mind, they have plans to introduce dozens of new and updated models to the market in the next 3–5 years, including nearly 10 new and second-generation releases in 2017 alone. Canceling the credit will have disproportional effect on companies who sell most of their electric cars in the U.S. market. In 2012, half of EV sales were in the U.S. But the rapid development of other markets has reduced the U.S. share today to less than 20% and next year it probably will be half of that. Removing the federal credit will reduce the ability of domestic car companies to compete in this global market. There are certainly ways that EV incentives could be improved. Because incentives are less important to wealthy buyers of expensive vehicles, and to improve access to EVs across income groups, some states are considering capping rebates based on purchaser income or vehicle manufacturer’s suggested retail price (MSRP). Research also shows that full electric vehicles have higher benefits to the environment and should receive higher incentives. Some studies show that point of sale rebates are more effective at incentivizing sales than tax credits. There have also been proposals to provide some incentives to car dealers, who are generally less familiar with EVs and may be less inclined to sell EVs than conventional vehicles, which bring in more recurring revenue from maintenance. We should debate the best and most cost-effective incentives to support the domestic automotive industry and the development of the EV market. What is certain, is that incentives are hugely important. The federal EV tax credit could certainly be improved, but incentives are clearly needed. Our nation’s health and highways will benefit from a growing number of cleaner vehicles that are within reach of all American consumers. Gil Tal is a researcher at the Plug-in Hybrid & Electric Vehicle Research Center of ITS-Davis and graduate advisor for the UC Davis Transportation and Technology Graduate Group. Austin Brown is executive director of the UC Davis Policy Institute for Energy, Environment, and the Economy.